Peanut Butter Crunch wins a gold star at Great Taste 2017! 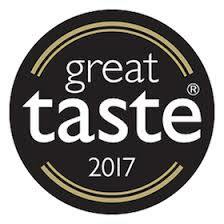 We are delighted that our newest flavour “Peanut Butter Crunch” has won one gold star at the years Great Taste Awards. The judges commented on the beautiful peanut crunch, the smooth texture and subtle caramel flavour was a hit with all the panel. This entry was posted on Tuesday, August 8th, 2017 at 4:08 pm by Dan and is filed under News & Events.